GoIP traffic termination in Benin can bring a stable high profit. The country has a well-developed mobile sector, which is represented by several competing operators. The mobile company Moov is the second in terms of market coverage as its services are used by more than 3.3 million subscribers. To get high incomes, you need to choose a profitable prepaid package. MoovVivo. One minute of the on-net call costs $0.1, while the subscriber receives a 30-megabyte bonus for mobile Internet. Moov First. The tariff for on-net calls is $0.1 per minute. For $0.05 per minute, you can call 12 destinations abroad. The cost of connection is $3.4 dollars, with a $1.7 bonus provided to the account. With each account top-up, the subscriber gets a 100% bonus (the top-up amount doubles). EpiqNation. The cost of on-net calls is $0.1 per minute, while you can send an unlimited number of SMS per day. 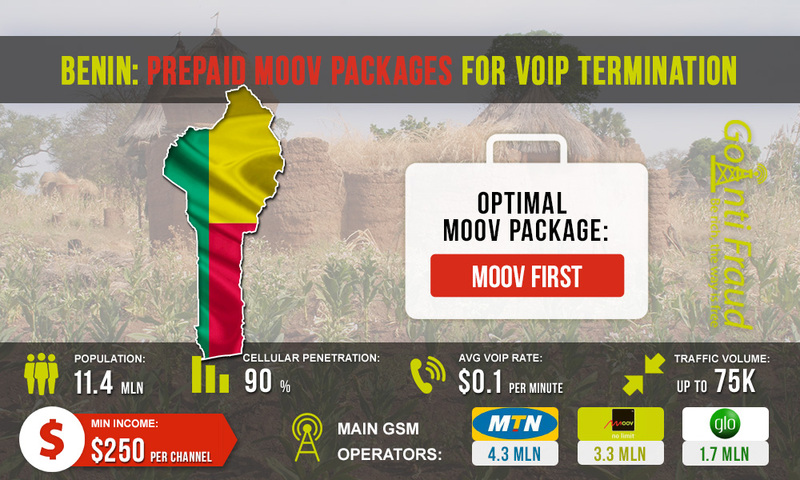 To successfully terminate calls, we recommend that you give preference the Moov First package. Due to the bonuses you get when connected, the cost of switching to this tariff plan will cost $1.7. Additional costs for SIM-cards - 50 cents per piece. Since this package provides 100% bonuses when you top up your account, one minute of the call, in fact, will cost twice less than the standard tariff ($0.05 per minute). Accordingly, using Moov First you can make $250 from one channel. Using multi-channel equipment (for example, PorTech systems or GoIP 32), you can significantly increase the profit. Expand capabilities of GoIP equipment by connecting it to GoAntiFraud! We provide proven tools to increase the efficiency of GSM termination. Our service will help extend the lifespan of SIM-cards, computerize workflows, and remotely manage GoIP equipment from anywhere in the world.